Seiko’s Tuna is one of the most recognizable and unique divers of all time. The model series began in 1975 in direct response to a customer letter. 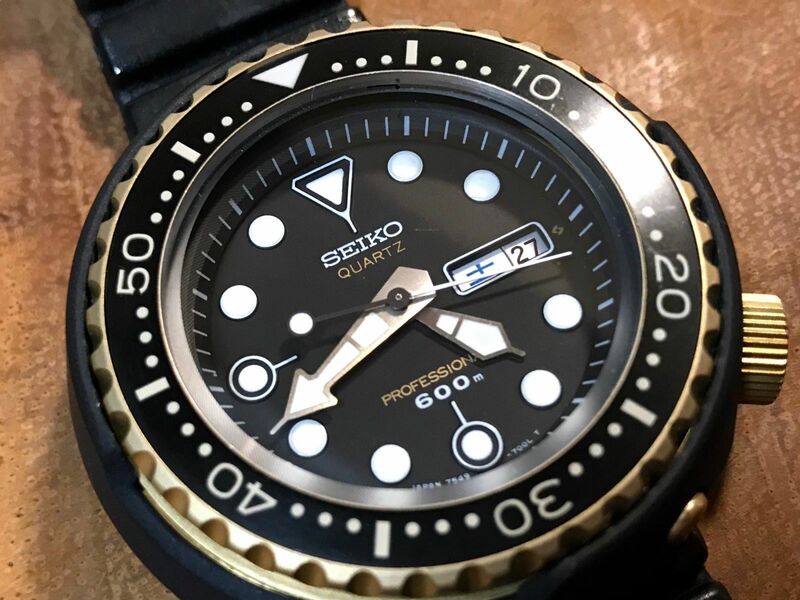 One professional diver complained to Seiko that their dive watches were not robust upon impacts and that the gaskets were letting go in saturation diving. In a triumph of customer service not often seen today, Seiko listened. What resulted is this (although this exact reference came a few years later). This professional dive series, nicknamed the Tuna, was a 1970s Seiko’s attempt at the perfect professional diver. They used a titanium monocoque and shroud with a locking ring to secure the crystal in this beastly one-case design. True notoriety was achieved in 1981 when this exact reference was spotted on Roger Moore’s wrist in Bond’s For Your Eyes Only. The reference is only on wrist for a few frames after the diving scene. That ‘Golden Tuna’ reference is what popped up for sale today. This generation replaced the original grandfather Tuna but varied little. Available in gold, titanium, and all black, and a few special editions at the start, the 7549 transitioned from mechanical to quartz in this model. It was released at the brink of the quartz crisis. They’re all fairly hard to come by in great condition today. This example comes from Japan, as one might hope. I’ve always liked date wheels in script from the country of origin. To me, it feels like the purest expression of the maker. This JDM 7549 is just that. In addition, it’s in a beautiful condition. The gold is unscratched, the dial and hands perfect. It comes on its original strap, although worn. The crystal shows light markings. It is a lovely beast. Find it here for 1950 USD.